From Fort Walton Beach, Florida, Coffee played his college ball at the University of Alabama. His best statistical season came his junior year, when the RB ran for 1,383 yards and 10 TD’s, averaging 5.9 yds per carry. He was named to the AP All-SEC 1st team. 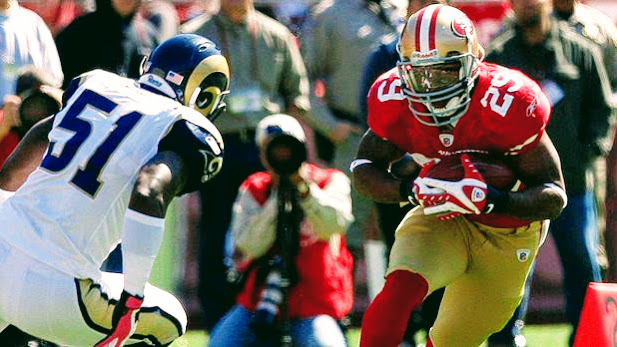 Coffee entered the NFL as a 3rd round selection on the 2009 draft by the San Francisco 49ers. As a rookie, he ran for 226 yards and 1 TD on 83 carries, finishing second on the team in rushing to Pro Bowler Frank Gore; however, he left the 49ers during training camp in 2010 to enter Army Ranger School. He enlisted in the Army in 2013 and served as a specialist in the Army infantry for nearly 4 years . In 2017, at age 29, Coffee announced he was attempting a comeback. He turned to The Spring League Summer Showcase for the opportunity to test his skills against elite competition.